Mike Rowe, former host of TV show Dirty Jobs and known as “the dirtiest man on TV.” has seen too many young people taking out student loans that do not lead to well-paying, satisfying careers. This prompted him to establish a scholarship for trade and technical training. Personally, I think it’s insane to start a career thirty grand in the hole, especially when there are no jobs in your chosen field. 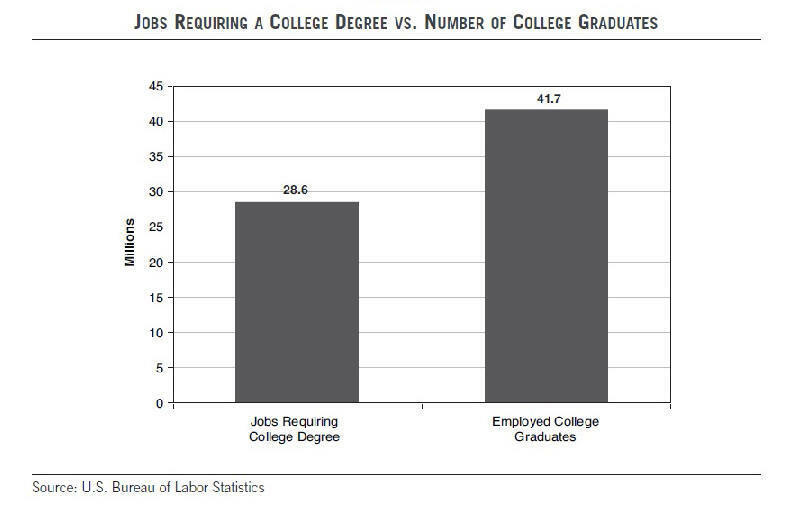 The fact is, the vast majority of jobs today do NOT require a four-year degree. They require training, and a truly useful skill. I think we’ve confused the cost of an education with the price of a diploma. That’s why I started The mikeroweWORKS Scholarship Fund. I want to challenge the idea that an expensive four-year degree is the best path for the most people, and call attention to thousands of real opportunities in the real world that real companies are struggling to fill. So far about half a dozen technical schools are participating in the scholarship program. Application requirements include an essay, attendance records, and references. Applicants must also sign the S.W.E.A.T. Pledge (Skills & Work Ethic Aren’t Taboo), an affirmation expressing a strong work ethic and self-reliance. Here’s one statement from the pledge. Back in the 1970s, Rowe saw a poster in his high school guidance office that gave what he thought was horrible advice. It urged students to“work smart, not hard”. 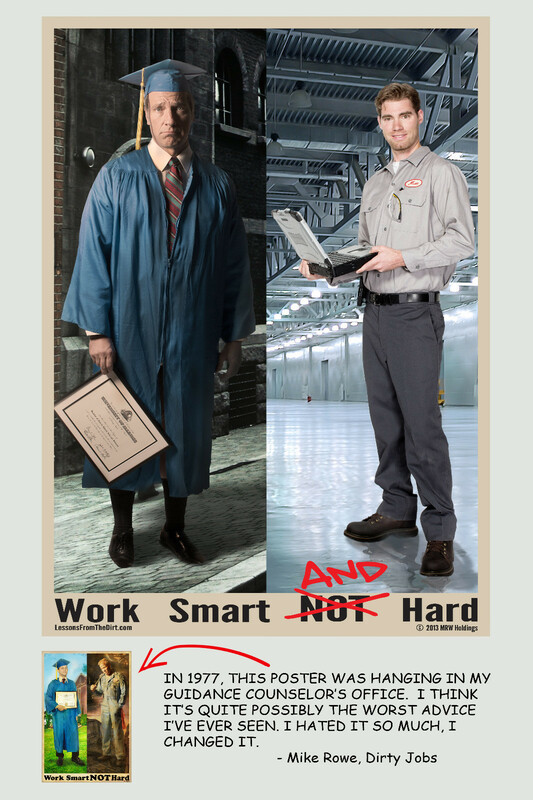 … The picture of the person working “smart” was holding a diploma, and the person working “hard” looked miserable performing some form of manual labor. Rowe created an alternative poster with a new message. What he’s against, Rowe added, is that we started promoting college “at the expense” of the vocational training that, in many cases, is what’s actually needed for the career. Of the roughly three million jobs that companies are struggling to fill, Rowe said only 8 to 12 percent require a college degree. It’s true that too many college graduates are chasing too few college-level jobs. I dunno… This targets CC type students, who generally aren’t taking loans out anyway, so I am not sure it will make a dent in the student loan problem. The marketing, too, is so in-your-face that I think it could be a turnoff. Certainly, directing money to technical and vocational programs is a good idea. Did you see the announcement yesterday of Obama’s new initiative in that direction? I think one target group would be those students who take out loans to attend for-profit technical schools. They seem to be a particularly troublesome group with high default rates. What seems too “in-your-face” marketing may appeal to a certain segment of students. It doesn’t strike me as over the top, and sometimes it seems that young people are more attracted to ads with a bold tone like this one. I’ll have to look for the Obama initiative announcement. Thank you for clearing up the myth that CC students in vocational tracks don’t take out loans. We see students everyday who are interested enrolling in a voc-tech program. They range from traditional age high school seniors who took interest in a vocational track in grades 9-12, to older adults coming back to school to change careers or re-tool skills. The common denominator is not all of them get FAFSA based aid and have to turn to loans. I am all for the in your face marketing like that of the MRW scholarship because it is saying what so many are afraid to say. Although, I do wish that there were more programs and donor organizations funneling money to traditional Community College systems to help with the increasing costs of competing with the for profit technical schools. I hadn’t been thinking of for-profits, though it does make sense. That is the sector most in trouble right now. For profit colleges are seeing the biggest drops in enrollment. But I have read that students who go to non-profit CC’s, which are mainly public, are less likely to take out loans. One big reason, of course, is simply that non-profit CC’s don’t cost that much. Another, though, is the population who goes to these CC’s – they tend to be less willing to take out loans. As for the marketing, I find my college students do not respond well to anything “in your face”, which they see as disrespectful (a common word in their vocabulary). They like the style of marketing that my ancient brain finds inscrutable. Assessment testing should be used to determine high school and college majors. It should start in middle school, not high school or college. That way, based on students’ interests and aptitudes, they’ll have some idea of their options and whether vocational or traditional higher education applies. Then they may also find school to be more relevant. Parents mean well by saving for their kids’ college education before knowing whether or not the children are college material or even college-bound. People follow many traditions without questioning the productivity of those processes. There’s supposed to be a point to basic education, and we haven’t been telling kids that it’s goal-oriented (majors and careers based on genuine interest). I think most Americans would find it hard to get on board an educational system that tracked students into particular career paths as early as middle school. But such a system would help address the problems related to the “college prep for all” system currently in place, including a downgrading of academic standards and the admission of too students who are unprepared for college. One problem I have with early tracking is that it lets schools off the hook for improving teaching. IMO too many students are doomed to fail on the academic track because of substandard curriculum and instruction. But I generally do support a vocational track for high school graduation.